PDF, PowerPoint, Excel, Word,Flash, video/audio files, e-books, images and much more. What happens when the Cloud Edition subscription is cancelled? When cancelling the Cloud Edition, new products can no longer be protected, existing licenses cannot be updated and no more online activations are possible. Products, which have been already activated, will not terminate unless regular online checks are used. For 30 days after the Cloud Edition is terminated, the Activation Server allows to activate products manually (by e-mail, fax or phone). You can create reports or make a backup of all keys. After this time, the Activation Server database is deleted. Can I use a standard USB-flash drive to deliver my files? Yes, All-In-One Protector allows to deliver the files on a standard USB-flash drive. It can be configured, on how many PCs the USB-stick can be used. When is a product activation required and which options are available? A download or CD/DVD version requires a product activation. Can I lock a license once it was activated? This feature requires an online connection. Can I do the CD/DVD duplication by myself? Yes, All-In-One Protector does not require a special CD/DVD. You can do the duplication by yourself. That allows you to publish small quantities. Which file formats and applications can be protected? Can I protect a web based flash (swf) application? To protect a flash application (SWF) with All-In-One Protector, it must run in a standard flash player. If the SWF file only works when it is launched through an HTML page, you cannot protect it. Another option for protecting a flash file is creating an EXE file from the flash application. A lot of flash tools allow to do this. Can I run a video, secured by All-In-One Protector, on a DVD player connected to a TV? 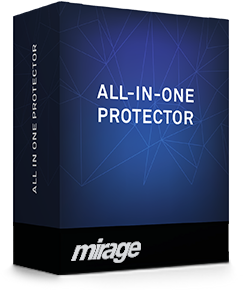 All-In-One Protector is a software solution which requires a Windows or MAC OS X operating system - it can not be used on a CD/DVD player without a computer. Can I use an external hard disk or even a Pen drive / Flash disk / Memory Card / SD Card to copy protect my files? You can deliver the content on an external hard disk or on a Pen drive / Flash disk / Memory Card / SD Card. Which Operating Systems are supported by All-In-One Protector? Can a user transfer his license to a new computer? Yes, All-In-One Protector has an inbuilt option that a user can transfer the license to a new computer.